Or just come and observe! A suggested donation of $5 – $20 is appreciated at the door, but no one will be turned away for lack of funds. The Machine To Be Another uses virtual reality to explore the relationship between identity and empathy and offers the experience of interacting with a piece of another person’s life story by virtually seeing yourself in the body of this person and listening to his/her thoughts inside your mind. The creators of The Machine To Be Another, BeAnotherLab, are in Seattle for the month of July working with fearless360º to conduct trainings and establish a node of the project here. The node will be run out of the Creative Exchange Lab, Seattle’s first public research lab providing community access to open-source art + tech + science incubation for collectively-owned, human-centered innovation and problem solving. Experience how virtual reality is being used to help us better understand the “other” and ourselves. BeAnotherLab is an international, interdisciplinary collective dedicated to investigate embodied and telepresence experiments. We believe that the understanding of the “self” is related to the understanding of the “Other” and that more than individuals, we are part of a broader system called humanity. Under this perspective, we search for innovative possibilities on the concepts of embodied interaction, extended body and extended mind by mixing low-budget digital technology with social relations, Web and neuroscience methodologies. Guided by a commitment to“XR for Everyone”, fearless360º is a creative agency that produces showcases, incubators and educational programming to inspire general audiences and impact the art and culture intersection of expanded media technologies. 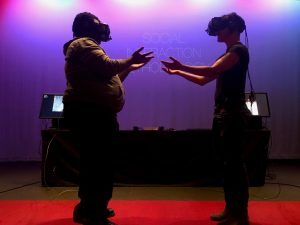 fearless360º launched in 2016 with Seattle’s first immersive storytelling festival SIFFXand this summer is running a pilot of Creative Exchange Lab out of Pacific Science on Thursdays and Fridays.